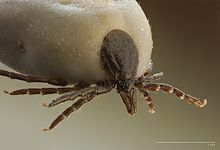 ^ Stafford, Kirby C.,III, Ph.D. , Chief Entomologist Connecticut Agricultural Experiment Station, New Haven "Tick Management Handbook" http://www.cdc.gov/ncidod/dvbid/lyme/resources/handbook.pdf. ^ Campbell,John B., (Extension Entomologist), Thomas, Gustave D., Entomology Research Leader "Controllng Ticks" University of Nebraska Lincoln extension, Istitute of Agriculture and Natural Resources, Rev. May, 2006 存档副本. [2010-09-19]. （原始内容存档于2010-06-06）.